I haven't quite yet figured out the working relationship among the Russian manufacturers Zvezda and Maquette and Polish companies Mirage and RPM , but quite often they tend to either borrow each other's molds (or just include sprues from the other manufacturers) or add resin parts to get a specific variant of another company's kit. Zvezda, Maquette and Mirage at least seem to have their own kit molds, so think they are ahead of the game. 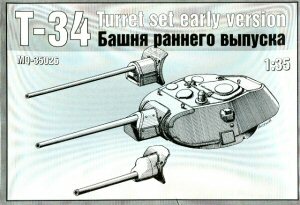 This is not so much a kit as an "instant conversion" set for any Model 1940 or Model 1941 T-34 kit, which converts it to the pre-October 1941 welded (rolled armor) turret made at Mariupol before the great evacuation of that month. This turret was fitted to both Model 1940 (76.2mm L-11 guns) and Model 1941 (either 76.2mm F-34 guns or the 57mm ZIS-4 antitank guns) production tanks. Maquette's kit provides three sprues that will produce the original and early production Model 1941 turrets, as they provide details for both the Model 1940's pop-up commander's periscope and the later Model 1941 flat welded plate that covered over that device when it was dropped from service. It also provides the early PT-4 gunner's sight and the loader's sight provided on early Model 1941s. The kit provides the mantelet and barrel for the three variants – the Model 1940 with the stubby L-11 gun, the standard production welded turret Model 1941 with F-34 gun, and the limited production (sources say from 25 to 50) tank-killing version of the Model 1941 armed with the ZIS-4 gun. This latter weapon was a tank mounting for the legendary ZIS-2 antitank gun, and was for many years only considered to have been a prototype. Photographic evidence and Russian researches now show that it did see service. The kit's main weakness is that the parts are rough in nature and also show the problems endemic in eastern European "flat" molding with old-fashioned injection molding equipment. Whereas the state-of-the-art DML Model 1940/41 cast turret consists of five main parts – sides, glacis plate, rear plate and roof – the Maquette kit requires seven parts with a completely different breakdown – turret base, lower turret floor, turret top, turret roof, turret backplate, and reinforcing panels on the sides. The result is that this is a much harder assembly to get a good fit on, and from personal experience requires putty and patience to get a good smooth fit of parts. It also will require simulating weld beads along most of the joint lines as well. The L-11 and F-34 are provided with separate muzzle sections, but the ZIS-4 is not. Maquette does provide separate mantelet and recoil assembly covers, so each does match its prototype. The kit does give a modeler with a DML or Maquette Model 1940 or 1941 kit another set of options, albeit the Maquette Model 1941 kit came with both the Model 1940 and Model 1941 barrels and mantelets. Overall, while it's not perfect, it does provide a way to use plastic parts to create a unique model from an existing kit.